Korean Manhwa Contents Agency (KOMACON) invited Helsinki Comics Festival for a visit to the Global City Networking seminar in mid August, 2014. The plan for the 5-day visit was to interact with Asian comics professionals and create a network for future co-operations. The seminar was held in Bucheon, a satellite city of Seoul. 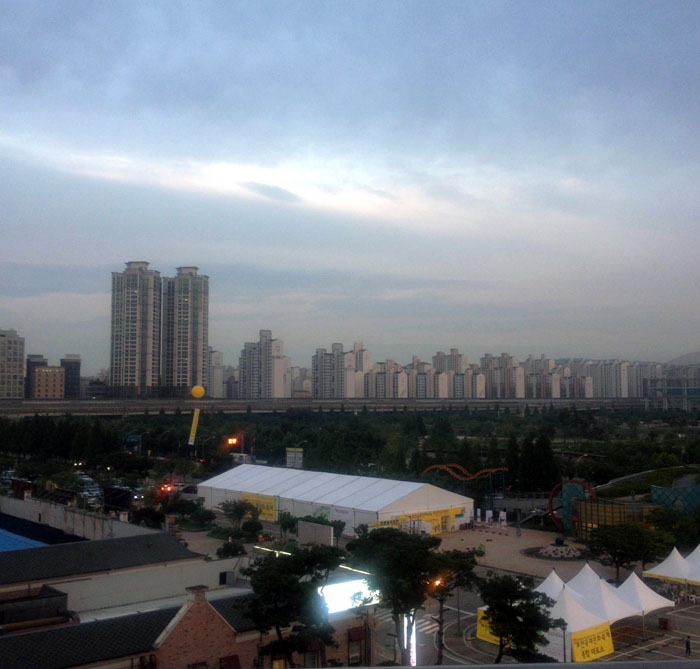 Bucheon city is an official home for Korean comics known as manhwa. 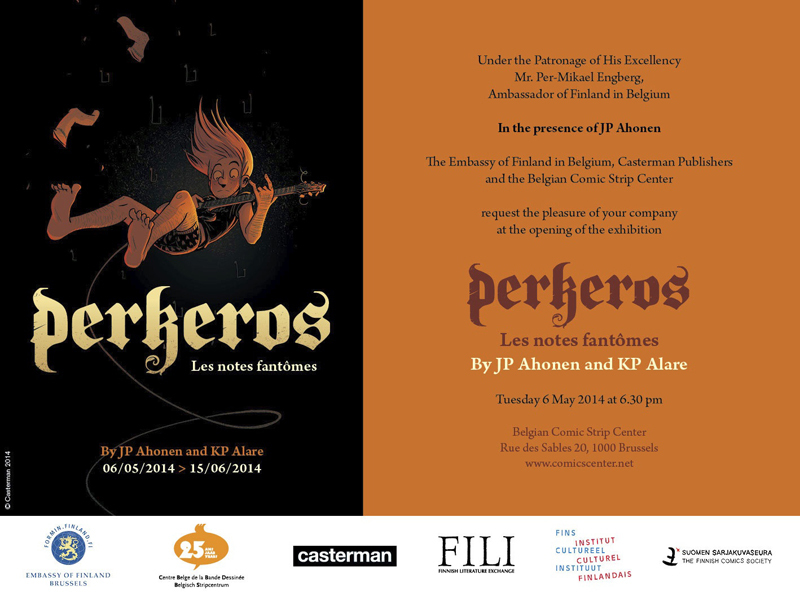 I had the honor of showcasing Perkeros over at the respected Belgian Comic Strip Center in Brussels. The exhibition served as an intro to the launch of the French translation of the book, published by Casterman. The Finnish Comics Society brings its culture export and collaboration events to Germany and Europe’s German-speaking countries. The series of events beginning this autumn culminates in October 2014 at the Frankfurt Book Fair, where Finland is the official theme country. 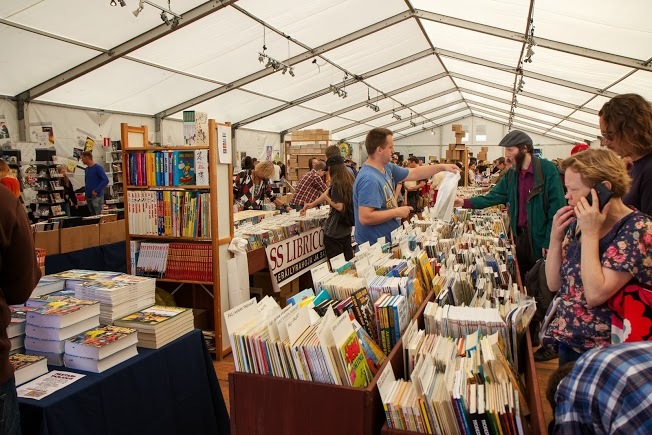 Germany is also the theme country of the Helsinki Comics Festival 2014. – There are many interesting things going on in Germany at the moment. Comics in general are booming, the field is expanding and the sales growing. Even the most marginal of things can grow to big proportions at such a broad language area, tells Kalle Hakkola, director of the Finnish Comics Society. – Even though the German comics culture is still light years away from French speaking Europe, the gap is constantly narrowing. Interesting new things are being created, and there is no such historic baggage in the comics culture as in the French-speaking world. In September the Finnish Comics Museum project coordinator Laura Kokko and the regional artist Solja Järvenpää from the Finnish Arts Promotion Center visited Belgium and its comics collections. More specifically, the Belgian Comic Strip Center in Brussels and the Hergé Museum in Louvain-la-Neuve. As well as being the capital of the European Union, Brussels is as also one of the world’s leading cities in comics. 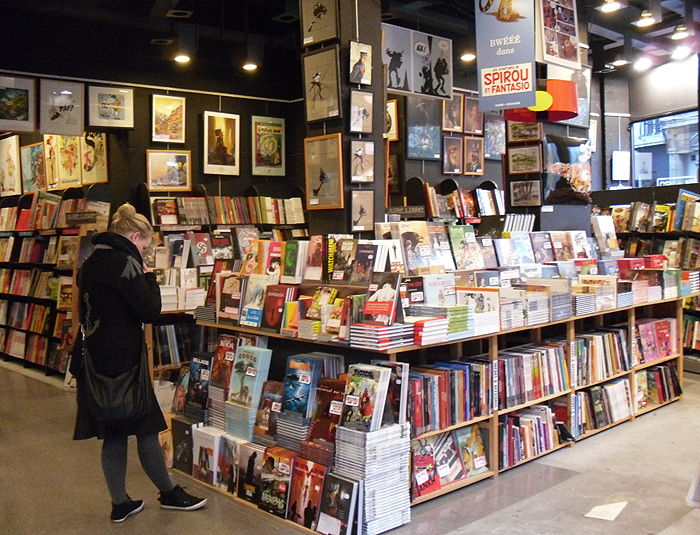 Numerous comic book shops, museums and exhibitions are inherent in the Brussels cityscape and events. 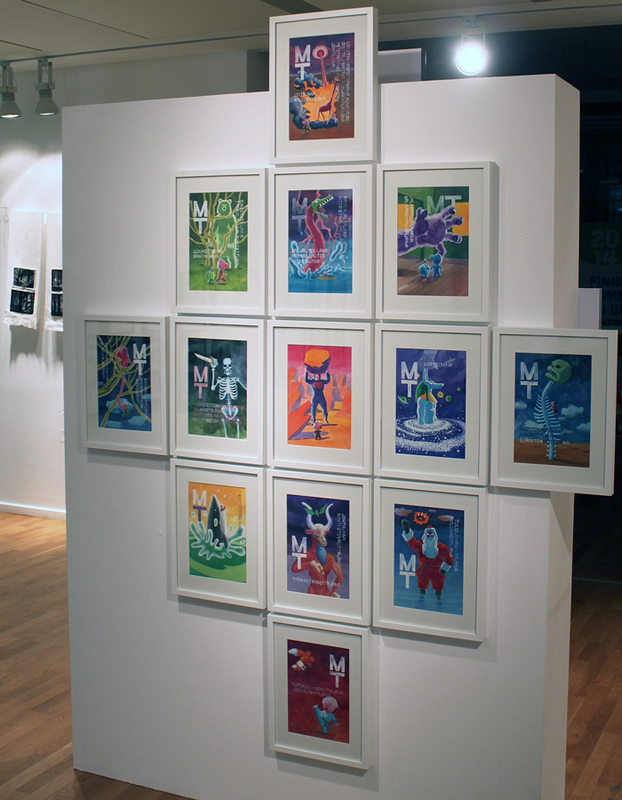 Finnish comics in Brussels from November 19th! At this occasion, the Finnish comics’ artist Amanda Vähämäki will present two original pieces. I have never been a huge fan of comics. The only comics I read are the French-speaking classics: Tintin, Lucky Luke and Astérix et Obélix. I still remember my French teacher in junior high who told us that we should read “real” books. She did not mean comics because that’s the sort of books she thought were for children. If in addition to that, you acknowledge my frustration caused by my inability to draw anything (not even a flower), you get why comics have never been my favorite thing. It just seemed unreachable somehow. I needed 25 years (my official age) and the willingness to learn Finnish to rediscover the joy of reading comics. My current internship at the Comics Center in Helsinki guides me through exciting adventures. And if I had to describe this world in three words, I would say that it is strange, profound and feminine. The 28th Helsinki Comics Festival is now successfully over. All the lost backpacks and mysterious bags full of clothes have been delivered to their rightful owners and all the leftovers from the volunteer foods have been eaten. The existential post-festival crises, on the lines of ”what am I gonna do with my life after this?”, have been dealt with and life at the Comics Center is starting to get back to normal. Tap water discharge Discharge in considered the artificial removing of top or subsurface liquid using a precise/ given locale.Standard water to be emptied can either be exterior or subsurface water supply brought on by streams, rainwater and springs or as seepages, all natural as well as man made supply of rainwater. Genetic assortment, which provides tactical of fittest associated with group, may be the morphogenetic miraculous through which we individuals originated creeping right out of the primordial ooze 40, 000 a long time ago, grunted through the use of primitive resources, stuttered from tongue creation, and appeared within the professional revolution.